LOS ANGELES, California, November 26, 2014 (ENS) – BMW’s i3, an electric car with a lightweight carbon fiber passenger cell and an aluminum drive module, has been crowned the 2015 Green Car of the Year, the first all-electric vehicle to take this honor. The German automaker’s 2015 i3 model was crowned with the award by the “Green Car Journal” at the Los Angeles Auto Show 2014. “BMW’s i3 is a milestone vehicle in many respects and illustrates the automaker’s expansive vision of future motoring,” said Ron Cogan, editor and publisher of “Green Car Journal” and CarsOfChange.com. The award was based on the BMW i3’s zero emissions at the point of use, its innovative lightweight design and the high percentage of sustainably produced materials used in its manufacture. “It is purposefully designed with a small environmental footprint and zero emissions, offering the best features of an electric vehicle with the functionality of an available on board engine-generator that nearly doubles its battery electric range,” Cogan said. While the i3 is designed as a battery electric car, its optional REx gasoline engine-generator enables extended driving range with electricity created on board, easing drivers’ potential range anxiety. The i3 was one of five finalists for 2015 Green Car of the Year. As runners-up, the Audi A3 TDI, Chevrolet Impala Bi-Fuel, Honda Fit, and Volkswagen Golf are honored by “Green Car Journal” with the title 2015 Green Car Product of Excellence. Leno has been a Green Car of the Year juror since the award program was launched in 2005. Along with Leno, the Green Car of the Year jury includes leaders of environmental and efficiency organizations including Jean-Michel Cousteau, president of Ocean Futures Society; Matt Petersen, board member of Global Green USA; Mindy Lubber, president of the nonprofit investment advisory group CERES; Kateri Callahan, president of the Alliance to Save Energy, and Dr. Alan Lloyd, president emeritus of the International Council on Clean Transportation and former CalEPA secretary and chairman of the California Air Resources Board. The jury is rounded out by a smaller number of Green Car Journal editors. The magazine’s vetting process considers all vehicles, fuels, and technologies as the field of nominees is narrowed down to five finalists that raise the bar in environmental performance. Vehicles that are all-new, or in the early stages of their model lifecycle, are considered and finalists must be on sale by January 1 of the award year. Availability and market significance are factors to ensure that models have the potential to make a real impact on improving air quality, reducing greenhouse gases, and promoting transportation efficiency, Cogan said. 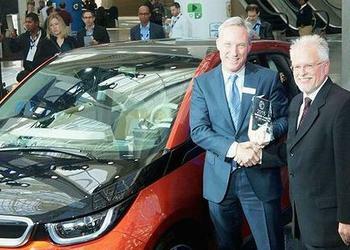 This latest honour adds to a long tally of awards the BMW i3 has picked up over the past year. More than 12,000 BMW i3s have already been sold since its launch in November 2013, making it the third best-selling all-electric automobile on the global market, BMW said in a statement acknowledging the Green Car of the Year award. 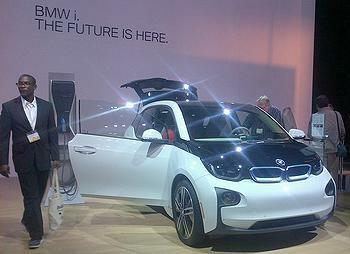 “Early adopters of the BMW i3 in Germany praise its sporty performance in particular. This is based on a 125 kW/170 hp electric motor, which offers highly responsive acceleration, and advanced chassis engineering,” the company said. These drivers mainly use their BMW i3 for everyday urban driving and for commuting to work. For the most part they charge the lithium-ion battery overnight, at home. The list of awards for the BMW i3 is long. In Germany, the electric car won the Green Steering Wheel 2013 award, one of the categories in the Golden Steering Wheel competition hosted by Auto Bild and Bild am Sonntag. And it was voted best car in its class in auto, motor und sport’s Best Cars 2014 awards. It also won two readers’ awards from “Auto Zeitung” magazine, plus the Auto Trophy 2013 and the Green Mobility Trophy 2014. The BMW i3 has also won the UK Car of the Year Award, the Next Green Car Award, the Fleet Hero Award and a class win in the “Sunday Times” Top 100 Cars list for the UK. This unique model won the Special Jury Award in the Swiss Car of the Year Award and scored a win in the French Trophées de l’Argus awards. In April 2014, a jury of motoring journalists from across the world named the BMW i3 World Green Car of the Year and World Car Design of the Year. The BMW i3’s exterior and interior design have earned it the German Design Award, the iF gold product design award and the Automotive Interiors Expo Award, while the French edition of “GQ” magazine named BMW i Head of Design Benoit Jacob Designer of the Year. In further tributes, Auto Bild voted the BMW i3 Design Innovation of the Year, and readers of Auto Bild Klassik named it Classic of the Future. Green Car Journal has hosted the Green Car of the Year Award annually at the LA Auto Show since 2005. This year’s show is open to the public from through November 30 at the Los Angeles Convention Center.